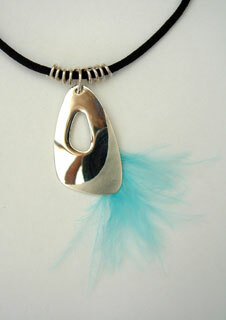 This pendant is formed of layered silver with soft, washable blue feather sandwiched between. The frosted pattern contrasts with the highly polished surface and complements the form of the piece. The pendant hangs on an extended silver spring through which the nylon necklet is threaded.